Not just clicks. Our extension can track number of readers, clicks, placed orders and new reviews. Send emails only to relevant customers. You can send emails depending on purchased products, customer group, order attributes. Get set up within minutes and start making your customers happy. There are no annual or monthly fees, just purchase and use. Some companies do not want to annoy their customers, and so distribute mailings once a month. Some companies would like to send emails to the customers much more often, but they do not have the resources to prepare high-quality emails weekly. With this extension, you will not lose the huge potential of email marketing. Upon the occurrence of an event (making order, change of order status, abandoned cart, etc. ), the extension automatically generates a chain of emails to be sent to the customer during a certain period, thereby reminding the customer of your store, their order, cart, bought products, etc. Before sending the letter, the extension analyzes the previous activity of the customer based on rules (opening letters, go to the link, making orders, number of reviews). Depending on this criteria, it can change the message chain. Extension tracks all shopping carts and can send follow-ups to customers or unregistered visitors who abandoned their shopping carts. After some time, the extension can automatically send ask review emails after purchase. Additionally you can configure mail-chain with few messages, if a customer does not place a review after the first email. After some time, the extension can send a winback message to customers who did not visit the store. Extension can send product recommendation emails based on previous customer purchases. 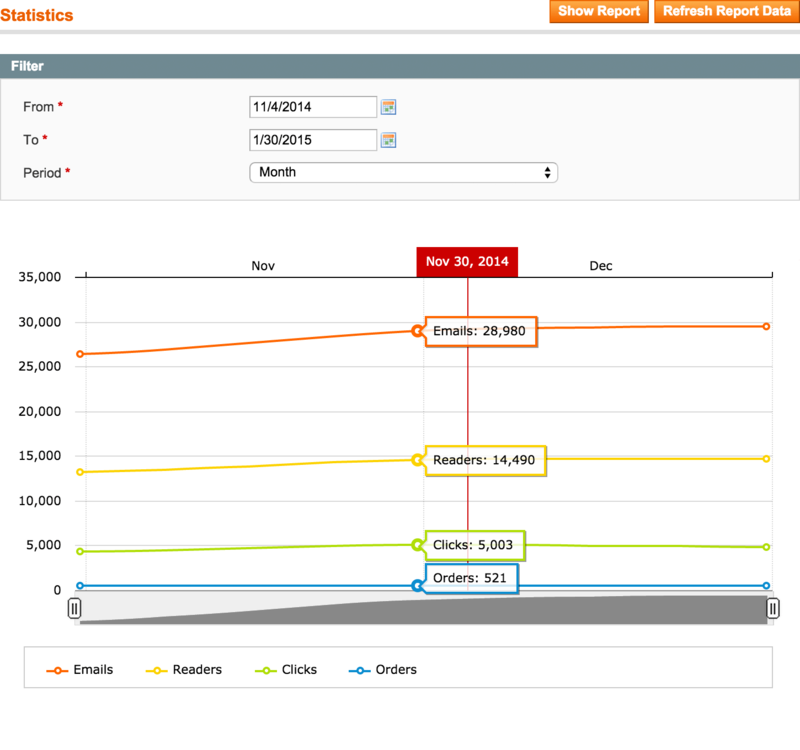 With Follow-Up Email, you can easily track your email marketing performance and improve it. Extension provides wysiwyg email editor. Also, the extension includes a few common magento email templates. Very dependable solution for closing sales on interested customers. Robust rule set. Follow up email is a great extension that is working fine, like they say. Support was essential. They helped me till extension worked fine on my website. I recommand. Thank you. непогана штука. Я її юзав у випадку, коли в мене людина купувала бензопилку - пропонував швиденько добрати масло і т.п. Спрацьовувало непогано. Єдиний мінус - не можна було послати листи тим, хто оформляв замовлення раніше. This follow-up email is by far the best marketing extension we have found till now. We have checked many follow-up emails and all those were lacking in one or another or so many features which Mirasvit has. Bang on Mirasvit, you nailed it in follow up email extension. Extension is well put together. Love that it already comes with templates so its pretty much ready to use right away! No Problems with the extension! Work Great but a little note: This module is not compatible with Quoting System. If you are using 3rd party quote system, the customer might get extra discount after quote. The module works perfectly and has met all my expectations generating smart emails with very positive results! First of all i want to say we have been trying 2 other extensions for this, but none of them performed like this one. To remind customers that we are taking good care of their abandoned carts and the items are waiting go home with them. Second we use it to remind the customers to come back, with even a coupon code with x% off or a free shipping coupon. It brings back customers. The price is ridiculously low compared that you are getting a "abandoned cart" and "follow up" extension in ONE extension. A very useful extension for sending emails of important events that become a sale more. Since we added the module to our shop the number of client reviews increased by 200%, we have used similar solutions, but no one has the value of this one. I recommend it. Really easy to use and the support time was very kind and helpful. The Mirasvit support was great as always. I feel stupid that I didn´t buy this extension before, it saves so much time and money. Incredible. Tried 3 different extensions similar to this. Non of them worked also technical support was terrible but this one was easy to set up didn`t even contact to tech support. Amazing extension. This is a very good extension, I recommand it ! We have been using this extension for a long time and it has definitely helped our business. Exactly what we needed! The support team is great and very friendly staff members. The extension works out of the box. You keep your data and you can do what you want with. You don't need to pay every month. It's great extension which give me many capabilities in selling and sending email to my clients. The technical support is great, quickly resolve my problems. Another solid Extension by Mirasvit! Very pleased with their work and support. Great company to work with. The visual editor is fantastic. nothing like it in other modules. Works very well.. Marvelous extension! It's working just one week and our shop and already paid for itself. The abandoned cart future worked just few hours after turning it on. Catching customer's e-mail address from any field in the shop is also perfect solution. Woow. The best. Increase sales and reviews. Hello visitors, give up searching for Supplier of Email Management module, this module Mirasvit is the best available for Magento. After we tried several others, we stopped at Mirasvit no doubt this is the best and most complete module for this purpose available for Magento. We are Customer Mirasvit from 2 years ago. Congratulations, Mirasvit is excellent. Amazing, this extension pays for itself. This extension is great. If you are looking for a way to save time not having to message you site visitors after they complete actions on your site (like signing up for a newsletter, adding items to their cart, or requesting reviews), then you need this extension. In one month this extension paid for itself. The shopping cart reminder feature is something no online store can live without, and it can be set to send out as many emails as you want. Could be the most useful magento extension we have added to our store. A MUST HAVE for all Magento store owner. Since I run a rental online store, I need user to upload their required document to their account. And my life will be easier if this extension can helps me to remind me if a customer upload their data! This is not their standard feature. So I asked their support Alexey Varlamov about the possibility to create a trigger relating to this needs. Before 24 hours, He sent me an update include a file that they created a new function based on my needs! Now I have trigger Customer Account Update in my store! This is above my expectation! Great extension and super Support. I love this company and his extensions. Great product and company will use again. Mirasvit is been the best extension provider for us. They give amazing support. We have no easily setup automated marketing mails to our customers based on their behavior. We like the way the email templates are so easy to set up. Once you have your design layout set (you can use the one supplied and drop in your logo). It is just a matter of creating the email and triggers. More importantly is the trust we have with the developer. They are quick to reply to questions (considering the time zone difference) and willing to assist. We also just bought Sphinx Search Ultimate. This is definitely a must have for EVERY Magento store. It builds customer relationships on top of the email, getting back customers who haven't visited in a while, reminding them of their abandoned cart / orders, asking for reviews or feedback, all in an automatic way. With one-time setup, I can see this extensions brings more value than any other extensions combined! We used this extension to collect reviews from customers shortly after dispatch of their order. It works really well and is easy to configure. Just a bit of styling of the email template and we were able to retrospectively send emails to all customers who had placed an order in the last 6 months. The default email template linked to the product page but Mirasvit change the code for us so that we could direct customers to the product review page. I would definitely recommend this extension. Great extension with amazing features. We can create truly awesome emails to send to our customers. It saved so much time for us and brought more sales. Great concept from Mirasvit! I love the cart restore button which auto logs in the customer with his cart items populated. Thank you! Just with the abandoned cart option alone, this extension proved it's worth. 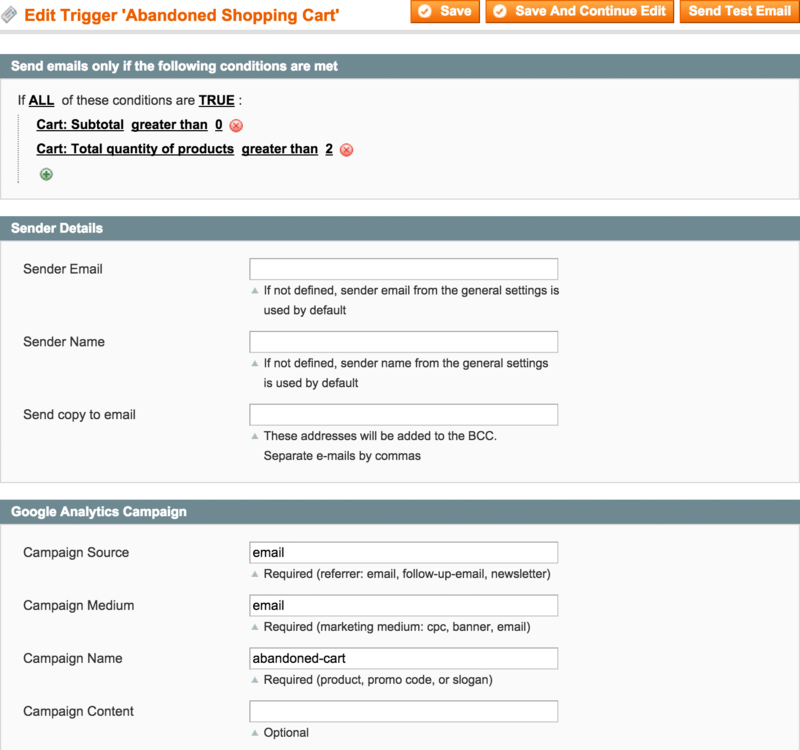 I love the extensive trigger options and the wysiwyg way you can design your emails in the back-end of Magento. Highly recommended! Great and easy to use extension. If you have the time and patience to set up the proper follow up emails, you will get an unbelievable ROI. We did it and the response and increase in sales has been amazing. Great job by Mirasvit once again! Really really great extension! The best for us! 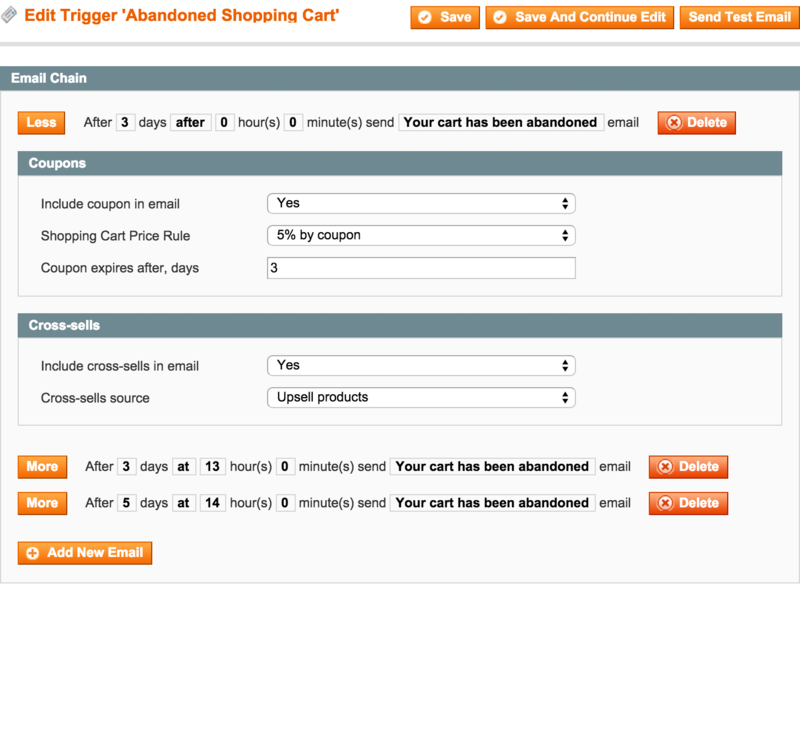 This extension grabs the name and email of customers, so you can send the abandoned cart emails to customers who stop the checkout process and don't create an account. I already installed and I will absolutely recommend this extension. This will increase your seals if you do a good job with your email follow up promotion. This module had an ROI of approx. 2 days in our shop - thank you very much for this great piece of software! Thanks Mirasvit for this great module! With this solution, we have received a few additional sales for a short time, this investment quickly pays for itself. does what it say it does! formally known as the email trigger suite!! Just updated the extension. It turned out that there are a lot of core improvements since the previous version that I had, because of that I lost my settings. MIrasvit support was great again and helped me recover my setup quickly. Keep the good work. It gives us an opportunity to create another touch point with customer. Great extension. Love you guys at Mirasvit for providing this! Very complete and smart setup of FUE. Good work. We are always so glad to see the name Mirasvit when we are looking for extensions. It is a pleasure to work with their friendly support. Any problems which occure are quickly solved. Their extensions always over-exceed our expectations but are not overloaded with useless features. The Magento Core team could learn a lot from this extension! The Analytics-tracking feature and Email Trigger work perfectly! When creating E-Mail templates you can view changes instantly, this eases the annoying process of designing an Email. Additionally you can directly write PHP code in the template allowing you to send dynamic emails. Our customer is happy, we're happy, everything is great! Needed something like this, which will send follow up emails. After installation there were some problems but mirasvit fixed them promptly. We gave an idea to include a new feature, after implementing that it will be even better! We just started to use it and it looks very promising. Very useful extension! As headline said this is the third time I'm purchasing this module and reason is that it works great and it boost our sales. The followup email extension works well and without any issues. The only feature I would like to see added is an option to set a trigger to not repeat for the same customer over a set period of time. Otherwise customers can end up queuing multiple abandoned cart emails. This extension works amazingly well. So far, we have only sent a few test emails, but everything works flawlessly and as expected. We found the extension configuration to be mostly intuitive and setting up a few triggered emails was easy. I can see this as an excellent tool for driving customers back to your store. We use this extension to retain our customers, get reviews, and convince potential clients to order. This extension works as expected. Great costumer support. This extension brings Enterprise features to your Community Edition. Congratulate your customers to their birthday, requests product reviews, take care of your customers with follow up emails. Everything is well thought, good organized and easy to use because Mirasvit knows how to do it. I highly recommend buying this module because it is working really great. Really good quality follow up email extension. Easy to use and reliable. And as always flawless support from Mirasvit team. Even the installation of version 1.0.1 was not straight forwards, , the support provided by Mirasvit was just perfect. All issues solved quickly and the extension works without any issues. A must have extension. Saves alot of work! Support is excelent and fast. Recommended. Extension really very useful and that works very well. We are very happy to have purchased. Technical support is excellent. I have installed this module for a client. It's very well put together and works great. There where some issues but the Mirasvit team fixed them in no-time. I have already bought 2 other follow up extensions from other developers. both also have after bugfix try from support does not work with 1.8.1 on my custom store. the developer of this plugin here were the only ones who could fix me all magento conflicts with other extensions. Support time is shorter than 24 hours. Miravist team is fantastic! Really! Their support is very professional and helpful! I had a special need with this extension, and they help me perfectly! And they send you an email with all the detailed changes! This extension provides exactly what we needed. It is easy to setup an email trigger and to customize your designs. I really like it. I love the product, the support team is quick and extremely effecient. The product could provide more default event criteria which can allow for a wider amount of triggered campaigns. While saying that with what is there you can do quite a lot, this a definite MUST HAVE for any sort business type big or small. Would be useful if we could have input on the development roadmap. I'm using Magento C 1.8. It looks great! and provides nice support. в события, отменяющие цепочку писем, неплохо было бы добавить "оставление отзыва". если человек отреагирует на первое письмо, второе и третье будут сильно раздражать. и ещё неплохо было бы добавить к условиям запуска наличие среди покупок клиента определенного товара (или одного из группы товаров). But I must say some of the elements really sound interesting. And to date we have only had good and fast support from Mirasvit. The extension works very well, the support is great! Solves all the problems of Magento's email!